Journal : Glasgow Medical Journal ; vol. xix. London : H. K. Lewis, 1883. Description : [1 l.] pl., 211-215 p. ; ill.: 1 phot., 3 figs. ; 22 cm. Subject : Breast — Tumors ; photomicrography. Author caption: By JAMES WHITSON, M.D., F.F.P. And S.G., Surgeon to the Dispensary of Anderson's College; Late Extra Dispensary Surgeon, Glasgow Royal Infirmary. Co-founder of St. Andrew's Ambulance Association. 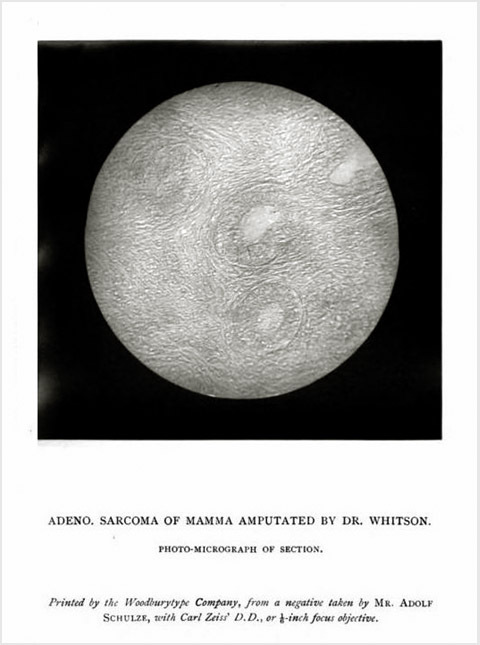 Reference: Whitson (1883), On a case of adeno-sarcoma of mamma; removal of growth; recovery. London: The Lancet; v. i (p. 1122). Reprint: (1883) The photographic times and American photographer. New York: Scovill ; vol. xiii, (p. 321-323). The photomicrograph plate faces page 168. Whitson reported on a case of spindle cell sarcoma of the mamma in the London Lancet and arranged to have a slide preparation made of the tumor for this photograph. Remarkably, no stain appears to have been used.